Patient-simulating phantoms have been used since the earliest dosimetric measurements in radiotherapy and radiology. The utility of these phantoms is well established and their use is justified in the standard radiotherapy physics texts. However, in this work, we will revisit the justifications on which the approximation of a patient by a phantom is based. Use of a water phantom as a surrogate for a patient is supported by the following two arguments. First, phantoms are unavoidably essential to commissioning and quality assurance (QA). During the commissioning of a treatment planning system (TPS), beam data are collected using a water phantom, usually one large enough to provide full scattering conditions. These beam data are then used by the TPS to predict dose distributions in actual patients. Patient-specific QA tests (PSQA), including point dose measurement, are performed using a water phantom, after exporting unaltered fluence patterns from the treatment plan. Using this sequence, beam data collection and PSQA tests are also done in water, and TPS dose calculations are done in patient computed tomography (CT) scan. A QA plan consists of an unaltered fluence pattern from the patient treatment plan which has been calculated in a phantom of uniform density and regular geometry. Although the TPS dose calculation is associated with its corresponding PSQA test through the unaltered fluence pattern, the dose calculation in the patient CT is independent of the calculation in the water phantom. Prasad et al. found almost equal values of Zeff for muscle and for water, 4.8 and 4.7, respectively. Therefore, it is expected that a water phantom should be a good choice, one that will faithfully mimic human tissue. However, in clinical radiotherapy, for example, for PSQA, plastic phantoms are often used instead of water. It is assumed that the performance of these plastic phantoms will be similar to that of water. However, available plastic phantoms have physical density and fluence scaling factors that are slightly different than those of water. For example, the PTW solid water phantom has a physical density of 1.029 g/cm 2. Other methods, such as Monte Carlo, can be used to generate an identical dose distribution in human tissue and in phantom. These are the justifications, but there is neither mathematical proof nor sufficient experimental evidence that a phantom can fully simulate a patient. In other words, it is a postulate that a phantom is equivalent to the patient for which it is surrogate. Treating the phantom as equivalent to the patient creates two approximations: first, the deformation from the patient's anatomy to the phantom's shape and second, conversion from a heterogeneous patient to a homogeneous phantom. In this work, we attempt to establish the equivalence between the phantom and the patient, using the concept of water equivalent depth (dWE) and its application in a TPS and in PSQA, using the concept of radiological depth. A total of seven patients were chosen for this study, each of whom had received radiotherapy treatment in our clinic. These include 3 lung cases, 2 head and neck cases, 1 brain case, and 1 pelvis case. These patients had been planned for treatment with dynamic, intensity-modulated, radiotherapy using the Eclipse V11.0 (Varian Medical System, Palo Alto, CA, USA) TPS. Eclipse calculates dose using the anisotropic analytic algorithm (AAA) with a modified Batho Power Law for its heterogeneity correction. To generate a water-equivalent phantom (WEP), the accuracy of the CT to electron density calibration curve (CT-ED) is essential. To create a CT-ED curve, a Gammex Model 467 ED phantom was scanned using a Philips Bright Speed CT scanner (Philips, The Netherland). CT images were then transferred to the TPS using the DICOM protocol, and a CT-ED calibration file was created for use in dose calculation. To verify the accuracy of our CT-ED calibration curve, the dWE of a typical radiological path was verified in a CATPhan 500. The TPS calculated value was found to be accurate to within 0.5%. A WEP was calculated from each patient CT, using the following method. All calculations were based on the isocentric axial plane, and in this plane, the ray traced from surface of the patient through the plane of isocenter was converted to dWE. [Figure 1]a shows the isocentric axial plane for a typical head and neck patient, with the source to skin distance and the central ray. Next, rays separated by 5 mm, in the plane of isocenter, were each converted to their corresponding radiological depth. Likewise, all the rays separated by 5 mm in the isocentric axial plane were converted to their dWE. This procedure was repeated for all available CT slices and for all available beams. The resulting dWE per axial slice was plotted as a radial function, maintaining the fixed geometrical relationship between the ray length, ray tracing direction, and plan isocenter. This produced a two-dimensional (2D) reconstructed CT slices reflecting the dWE. This same procedure was then repeated for all axial CT slices, so as to reconstruct the complete 3D water-equivalent volume. These reconstructed 3D volumes are presented in [Figure 1]b. Further, the sagittal and coronal planes were also reconstructed in TPS. Reconstructed axial, sagittal, and coronal sections of a representative patient-equivalent water phantom are shown in [Figure 1]c, [Figure 1]b, [Figure 1]c, [Figure 1]d, [Figure 1]e.
All the treatment plans were recalculated in the WEP by keeping the heterogeneity correction off as a QA plan using an unaltered fluence pattern. The planar dose was compared between the CT data set isocentric coronal planes and the corresponding coronal plane of the WEP calculated values. Planar doses were compared between the isocentric planes of the patient CT scans and those of the dWE phantom. The results obtained, using gamma matching analysis, for the seven different cases are presented in [Table 1]. The gamma index was calculated using threshold values of 2% dose difference and 2 mm distance-to-agreement (2%–2 mm) and using 3%–3 mm. Greater than 95% agreement was seen when using 3%–3 mm for all cases, except for one of the lung patients. [Figure 2] shows the gamma analysis results for the two head and neck cases and for the two lung cases. The head and neck cases show gamma fail only in the peripheral regions of the dose distribution. Furthermore, the mediastinum cases show some gamma fail in the lung area. 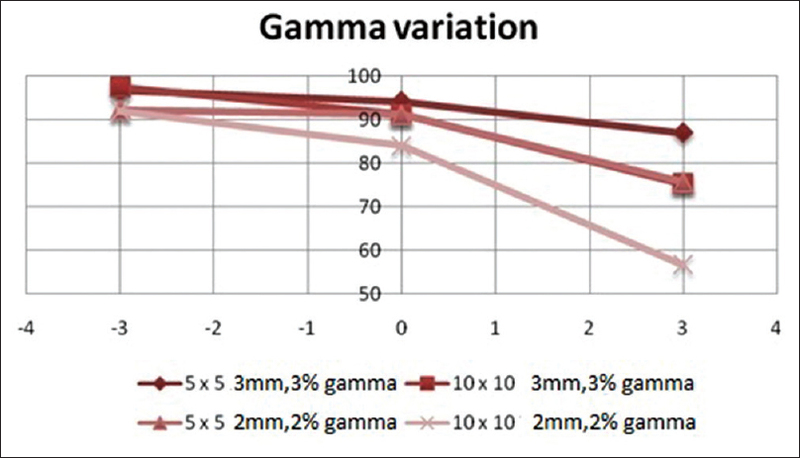 Gamma-matching analysis using 2%–2 mm shows a lowering of the pass rate. A pass rate >90% was obtained for all the cases except for the lung patient mentioned above. Lung patients showed a lower pass rate than did the other sites. This lower pass rate in lung cases might be due to limitations of the TPS's AAA dose calculation algorithm. It could also potentially have been due to errors in reconstruction of the WEP. Or, potentially, both of these might have been factors contributing to the mismatch. To understand this result, 5 cm × 5 cm and 10 cm × 10 cm open beams were considered. A flat open beam was selected to simplify testing. The beams were placed anterior in the mediastinum region of the patient CT scan and also in the reconstructed WEP of lung patient 1 as shown in [Figure 2]. Isocentric coronal planes were then extracted, and gamma-matching analysis was done. Gamma matching was tested for point gamma at ±3 cm from the isocenter position using a test criterion of 2%–2 mm and 3%–3 mm. Gamma-matching results are shown in [Figure 3]. Failure points for each evaluation criteria are located in the lung at the +3 cm position. Radiotherapy treatment delivery is validated by PSQA, and there are numerous methods of PSQA. These include point dose measurements, planar dose verification, and 3D dose reconstruction. These are carried out using portal imagers, film, ion chamber arrays, diode arrays, MU calculation software, and other methods.,,,,, All of these methodologies are based on phantom measurements; thus, it is necessary to establish the equivalence between heterogeneous patients and homogeneous water phantoms, and this equivalence has not previously been established in the literature. The present study establishes this equivalence. Transit dosimetry has advantages over other PSQA dosimetric methods, and some investigators describe it as in vivo dosimetry. Transit dosimetry simulates the situation where the patient's anatomical information is carried by the exit beam to the detector system. Although portal imager-based setup imaging has gained a wide spread application, portal image-based dosimetry has found only limited application. This is due to two reasons. Backprojection dose reconstruction methods are limited, and advanced backprojection software is not commercially available. 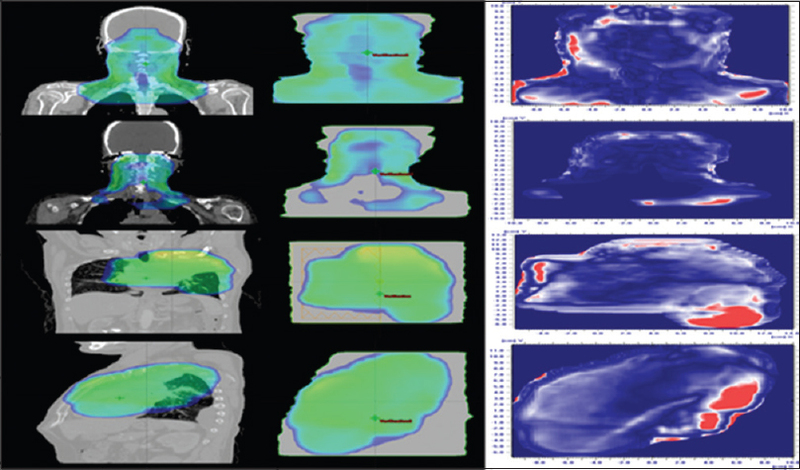 The Netherlands Cancer Institute developed its own software for calculating transit dosimetry using backprojection., In our study, we used a well-established and well-tested TPS. Furthermore, an EPID's backprojection dose reconstruction system and the TPS use two different calculation algorithms. In our case, only the AAA is available in the TPS and the backprojection algorithm has not been validated against the TPS. As the AAA and backprojection algorithms work independently, if there is a systematic error in either algorithm, this will significantly influence the dose verification. It is not clearly described by other investigators whether their respective algorithms have been validated against each other.,, Wendling et al. converted the patient into a WEP by forcing the density and keeping the patient's anatomic boundary unaltered. In our method, the patient's anatomy was deformed based on equivalent radiological path length. Although the anatomical boundary was deformed, all gamma matching was performed in the isocentric plan which was only undeformed plane offering a true dimensional gamma matching. Further introduction of the radiological path length accounts for the heterogeneity correction. Therefore, it can be stated that Wendling et al. dominated the tissue heterogeneity correction, whereas we have corrected for it. To overcome the problems of dose reconstruction using a backprojection technique in a heterogeneous medium, we have converted the patient into a homogeneous water phantom and reconstructed dose without altering the fluence pattern of the actual treatment plan. However, we could not circumvent the problem of improper dose reconstruction and lower pass rates in the lung area, as reported by other investigators.,, We could not resolve whether this problem was due to limitations in the TPS's dose calculation algorithm, limitations in the WEP reconstruction, or both of these factors. A lower gamma passing was seen for open as well as intensity-modulated fields in lung cases. We did not account for the noncoplanar beams as ray tracing is difficult in the noncoplanar direction. Although not tested in this study, however if tested, noncoplanar beam will act similarly to that of a planar beam. At present, described article is suitable for all kinds of target volume like re-entrant target volumes (normal tissue-target-normal tissue-target) or the target volumes that inherently contain inhomogeneities as ray tracing does not differentiate between normal tissue and target volume. 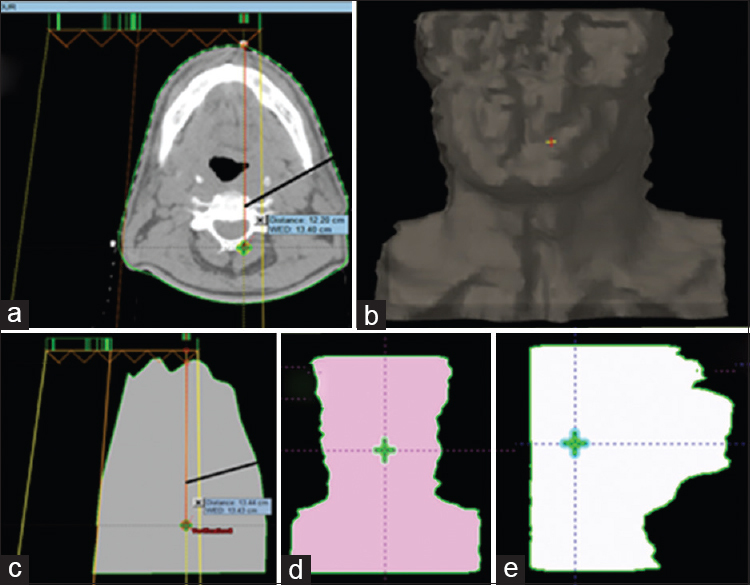 We encounter “normal tissue-target-normal tissue-target” situation in case of head and neck cases where the passage of radiation sees the normal structure and target alternatively when looked laterally from gantry 270° and (or) 90° and heterogeneous target volumes in bone metastatic cases. The former situation is called as the re-entrant “normal tissue-target-normal tissue-target” situation and our algorithm works well even under such difficult condition(s). Presented algorithm fails with the metallic implants because of the fact that CT-ED file is not appropriate in the gray scale range provided by metallic implant. However, if it is possible to obtain an accurate CT-ED file in the gray scale range yielded by metallic implant, algorithm will deform the anatomy appropriately to provide accurate radiological distance hence to offer an accurate calculation. The present work shows that a heterogeneous patient can be converted to a homogeneous water phantom. The conversion was done manually using 2500–3000 points from the TPS. This work is time-consuming and labor intensive and was complete for only seven patients. This work will later be extended to 3D dose reconstruction and verification for patient-specific customized phantom measurements. This study demonstrated the equivalence of the patient and its corresponding water phantom using the concept of dWE. The IMRT planar dose verification was established between the treatment plan made in patient CT scan and patient WEP. However, it may be questioned about the rationale of our study. 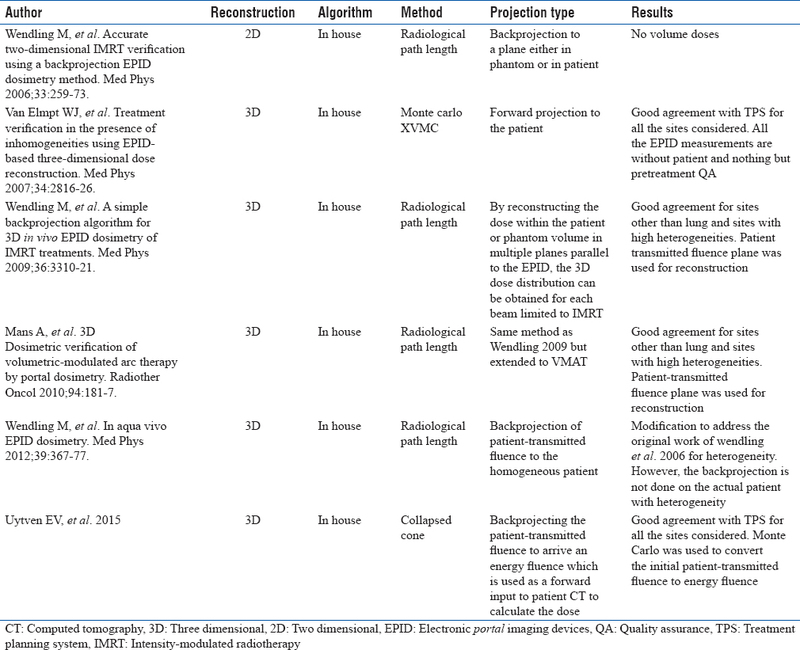 This study is a step to build an efficient “in vivo” (transit) portal (EPID) dosimetry algorithm which will be more accurate than any of the presently available EPID dosimetry techniques, which will be presented in the subsequent articles.,,,, [Table 2] summarizes and compares the physical principle and outcome of the different fundamental transit dosimetry methods. Radiological path length was the most preferred technique for transit dosimetry since its introduction in 2006; which is also the basis of our present work. Literatures review although reveals that radiological path length technique works well in the less heterogeneous medium, it fails in case of large heterogeneities like lung. This is attributed to the incompatibility in terms of the accuracy of the algorithm used in planning system and transit backprojection algorithm. The backprojection algorithm works well in soft tissue or muscle. Even though the discrepancy is not so high in case of bone; back projection algorithm fails in high heterogeneity cases like lung because of the inaccurate dose calculation in TPS. Furthermore, on the top of the effective radiological path length-based corrections, TPS dose calculation also accounts for the additional corrections such as kernel-based scatter dose calculation for AAA dose calculation engine; for more advanced dose calculation algorithm like Monte Carlo or Boltzmann transport technique, use a ray tracing method. However, in vivo backprojection algorithm considers only the radiological depth, which introduces the discrepancy in the dose matching between the TPS and the backprojection algorithm. To establish an efficient in vivo transit dosimetric method, it is essential to establish a good agreement in homogeneous medium at the first point. This is established in the present study by converting patient into a water-equivalent anthropomorphic phantom using an equivalent radiological path length technique. This will be further implemented in the EPID transit backprojection algorithm for in vivo dose computation more accurately than any presently available techniques. Khan FM. The Physics of Radiation Therapy. 4th ed. Philadelphia: Lippncot Willims & Wilkins; 2009. p. 405. Sarkar B, Ghosh B, Sriramprasath, Mahendramohan S, Basu A, Goswami J, et al. Optimized point dose measurement for monitor unit verification in intensity modulated radiation therapy using 6 MV photons by three different methodologies with different detector-phantom combinations: A comparative study. J Med Phys 2010;35:144-50. Spiers FW. Effective atomic number and energy absorption in tissues. Br J Radiol 1946;19:52-63. White DR, Martin RJ, Darlison R. Epoxy resin based tissue substitutes. Br J Radiol 1977;50:814-21. Prasad SG, Parthasaradhi K, Bloomer WD. Effective atomic numbers of composite materials for total and partial interaction processes for photons, electrons, and protons. Med Phys 1997;24:883-5. Siddon RL. Calculation of the radiological depth. Med Phys 1985;12:84-7. Dunn L, Lehmann J, Lye J, Kenny J, Kron T, Alves A, et al. National dosimetric audit network finds discrepancies in AAA lung inhomogeneity corrections. Phys Med 2015;31:435-41. Syamkumar SA, Padmanabhan S, Sukumar P, Nagarajan V. Characterization of responses of 2d array seven29 detector and its combined use with octavius phantom for the patient-specific quality assurance in RapidArc treatment delivery. Med Dosim 2012;37:53-60. Infusino E, Mameli A, Conti R, Gaudino D, Stimato G, Bellesi L, et al. Initial experience of ArcCHECK and 3DVH software for RapidArc treatment plan verification. Med Dosim 2014;39:276-81. Manikandan A, Sarkar B, Nandy M, Sureka CS, Gossman MS, Sujatha N, et al. Detector system dose verification comparisons for arc therapy: Couch vs. gantry mount. J Appl Clin Med Phys 2014;15:4495. Chen X, Bush K, Ding A, Xing L. Independent calculation of monitor units for VMAT and SPORT. Med Phys 2015;42:918-24. Berry SL, Sheu RD, Polvorosa CS, Wuu CS. Implementation of EPID transit dosimetry based on a through-air dosimetry algorithm. Med Phys 2012;39:87-98. Wendling M, McDermott LN, Mans A, Olaciregui-Ruiz Í, Pecharromán-Gallego R, Sonke JJ, et al. In aqua vivo EPID dosimetry. Med Phys 2012;39:367-77. Mans A, Wendling M, McDermott LN, Sonke JJ, Tielenburg R, Vijlbrief R, et al. Catching errors with in vivo EPID dosimetry. Med Phys 2010;37:2638-44. Wendling M, Louwe RJ, McDermott LN, Sonke JJ, van Herk M, Mijnheer BJ, et al. Accurate two-dimensional IMRT verification using a back-projection EPID dosimetry method. Med Phys 2006;33:259-73. Wendling M, McDermott LN, Mans A, Sonke JJ, van Herk M, Mijnheer BJ, et al. A simple backprojection algorithm for 3D in vivo EPID dosimetry of IMRT treatments. Med Phys 2009;36:3310-21. Blake SJ, McNamara AL, Deshpande S, Holloway L, Greer PB, Kuncic Z, et al. Characterization of a novel EPID designed for simultaneous imaging and dose verification in radiotherapy. Med Phys 2013;40:091902. Gustafsson H, Vial P, Kuncic Z, Baldock C, Denham JW, Greer PB, et al. Direct dose to water dosimetry for pretreatment IMRT verification using a modified EPID. Med Phys 2011;38:6257-64. Van Uytven E, Van Beek T, McCowan PM, Chytyk-Praznik K, Greer PB, McCurdy BM, et al. Validation of a method for in vivo 3D dose reconstruction for IMRT and VMAT treatments using on-treatment EPID images and a model-based forward-calculation algorithm. Med Phys 2015;42:6945-54.